On June 11, 1962, USAF students at IFEL served as honor guard for President John Kennedy when he gave the Yale commencement address at Yale University. 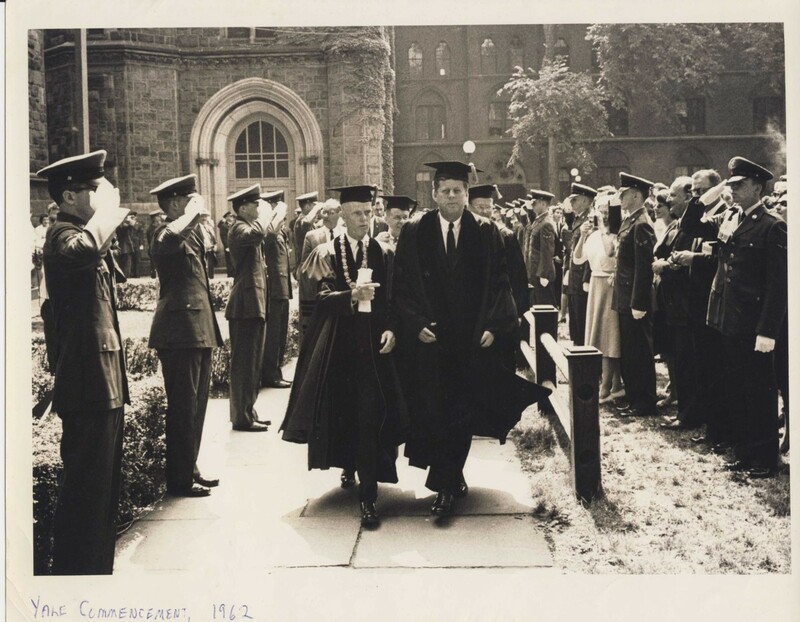 In this photograph, the man walking with JFK is the president of Yale, Whitney Griswold, who died the following year — almost exactly six months before Kennedy. Kingman Brewster, who was provost at the time, became president later in 1963. JFK is walking towards the commencement stage, which would have been directly behind the photographer. The stage was set up at a 45-degree angle in the “L” where Durfee Hall and Wright Hall meet perpendicular to each other in the northwest corner of the Old Campus. The photographer was facing east. Kennedy is walking from east to west along the south face of Durfee Hall. In this photo, Battell Chapel is visible in the background, behind Kennedy. Durfee Hall would be to the left and the Old Campus would be to the right.